lower pressure drop than comparable systems. In addition, HS-79 provides extreme flexibility and ease of installation and cleaning. It has a tight bend radius. Higher vacuum capacity is possible because HS-79 has a higher hoop strength without using internal support coils that can restrict flow. It’s terrific for high vacuum applications, oil suction lines, etc. Moreover, XRP’s HS-79 assemblies feature a noticeably larger inner diameter that gives HS-79 greater flow capacity and better performance on race day! NOW Available..HS-79 Hose with Hypalon®! HS-79 hose with the Hypalon® outer covering as a fifth layer has increased resistance against abrasion and added ease of cleaning. Reher-Morrison carries an extensive inventory of high-performance and racing plumbing. 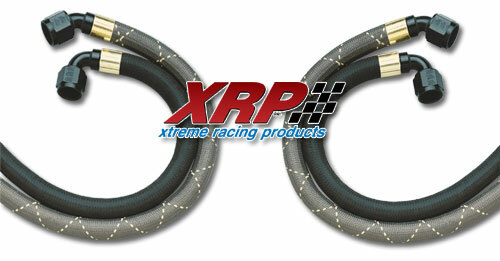 We primarily employ XRP® (Xtreme Racing Products) hose, hose ends and adapter fittings for sale and use on all of our engines. We believe they are the best available in quality, reliability and maximum performance. Reher-Morrison has the hoses and fittings you need to plumb your race car for maximum performance and reliability. We have the tools, crimping dies and accessories to build and test both stainless steel braided lines or the new technically advanced HS-79 hose system. Call our Parts Department today!